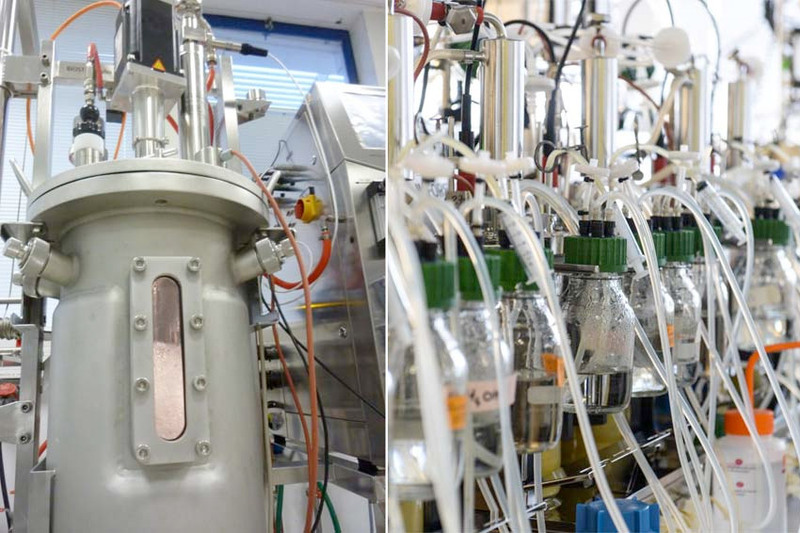 Since its creation in 2008, by Marc Delcourt – a biotechnologies entrepreneur – and Philippe Marlière – the program’s creator- Global Bioenergies has achieved several key operational milestones and is ready to move to commercial-scale operation. To begin with, Global Bioenergies successfully set up a laboratory-scale prototype to provide proof of concept for its technology. 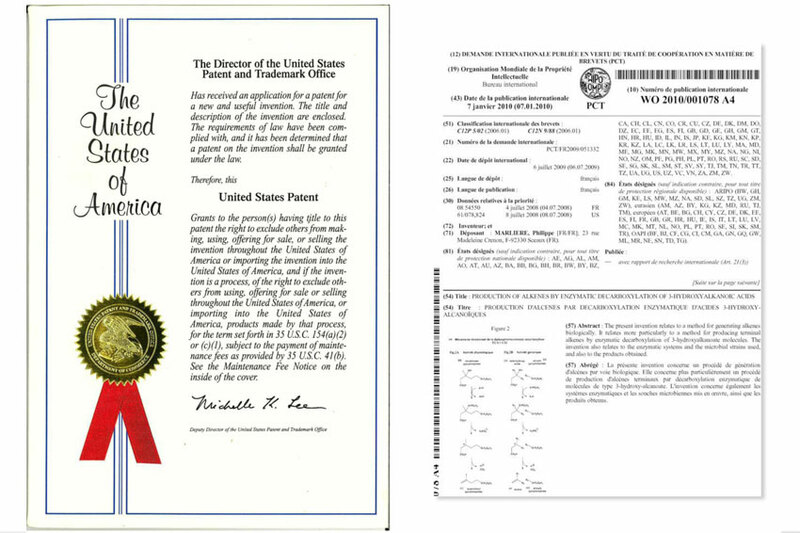 The Company also laid the foundations for its intellectual property, and it now holds exclusive rights to a constantly growing patent portfolio. Secondly, after its IPO on the Alternext market, the Company refined its process on a laboratory scale. To this day, it continues to make performance improvements. Stage 3, which began when €23 million in funds were raised in mid-2013, was devoted to industrialization. An industrial pilot with an isobutene production capacity of 10 tonnes p.a. was set up at the Pomacle-Bazancourt agro-industrial site close to Reims. This project was awarded €4 million funding by the French State as part of the Investment for the Future Program. The transfer of the process in an industrial environment at a scale ten fold larger than in the laboratory. An industrial-scale demonstrator has then been built at the Leuna refinery in Germany and is operational since early 2017. It prefigures the future commercial plants. Its industrial design is innovative and adapted to the gas fermentation process promoted by the Company. 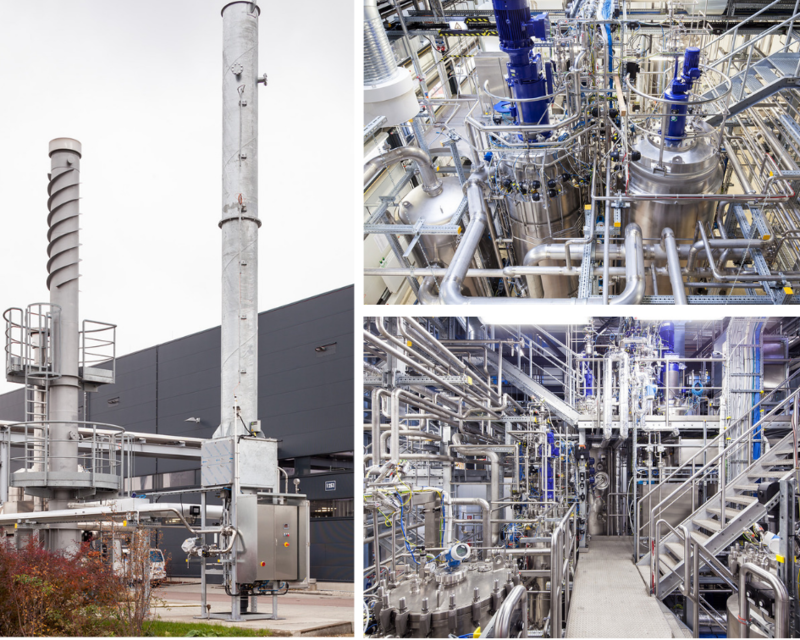 It is indeed the first time that a fermentation process targets a gaseous product which brings major advantages that will translate into reduced operating costs. It has been financed by a €5.7 million subsidy from the German government and a €4.4 million loan from a consortium of French banks. 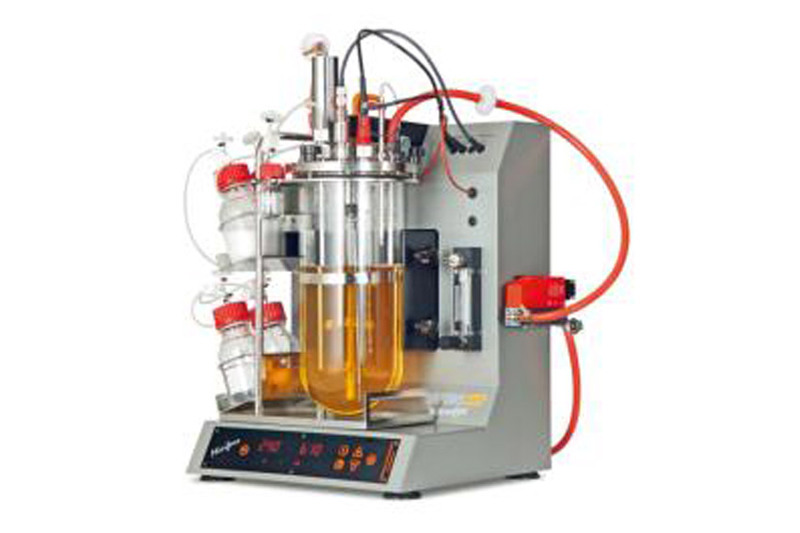 This demonstrator represents the final stage in industrialization of the isobutene process. 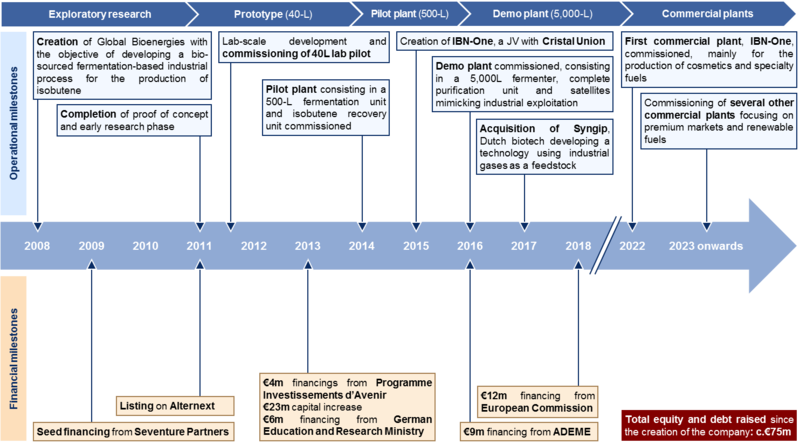 Venture between Global Bioenergies and Cristal Union named IBN-One. 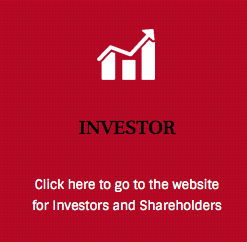 Each partner has invested c. €1 million. IBN-One was granted a license on Global Bioenergies’ process and its purpose is to finance, build and operate the first renewable isobutene plant in France. IBN-One prepares therefore on the one hand the financing of the €140 million required for the plant’s construction and in parallel the commercialization of the future production. Letters of Intent representing ove 50 000 tonnes of products have been received from large industrial actors from various sectors: cosmetics, specialty fuels, aviation fuels and automotive fuels among others. Anchored on high value add markets, this first plant would be highly profitable. 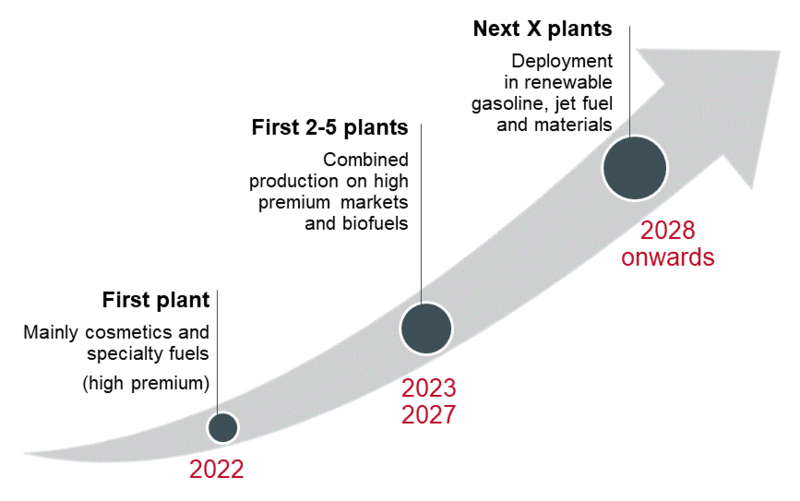 In its nominal scenario, this one plant would enable Global Bioenergies to reach profitability via a mixed flow of licensing fees and dividends. A stronger valorization, by States, of renewable solutions as a means to battling climate change. If this comes to fruition, Global Bioenergies’ isobutene process may be used in hundreds, if not thousands of plants that will radically transform the global industrial landscape.